We arrived back in London late afternoon yesterday, a day later than we were suppose to because we loved Bath (and especially the B&B in which we stayed) so much we decided to stay an extra night. It was such a nice reprieve from the big cities we've been visiting, and everyone was so friendly, that I'd love to come back to the UK and just spend a good chunk of time in that part of the country. 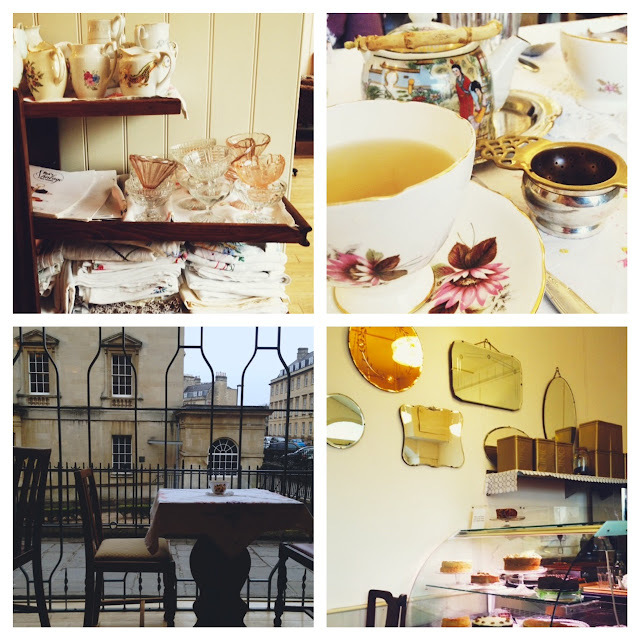 After we saw the sights, we got in the car and made the journey to Bath, where we ate at Bea's Vintage Tea Room (thank you Ali from Sweet for the recommendation! ), this amazingly cute cafe that served proper tea and really delicious lunch. It was decorated like a tea room from the 1940s, and I fell in love with every little bit of it! I ordered the carrot and white bean soup, and then the macaroni and cheese, which the waitress said was Bea's grandmother's recipe. It had chunks of tomatoes and I think some chili powder in it...so good! I also ordered a pot of tea, which came in a vintage teapot, with a vintage teacup and saucer and a vintage strainer to pour the tea through since it was loose leaf....and of course I loved it all! Once we had our fill, we walked around town a bit and popped into a couple shops before deciding to head to our B&B, which was 15 minutes north of Bath in Colerne. It was called Trimnells House, and if you're ever in the area and looking for a place to stay, stay here. 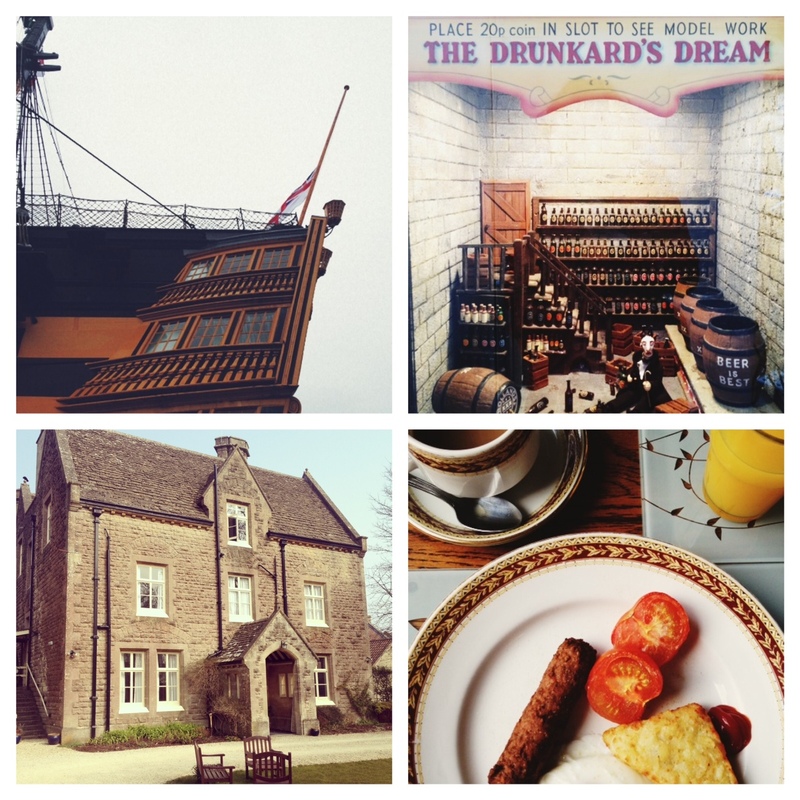 The rooms were really nice, the beds really comfortable, and the breakfasts were outstanding! We walked to one of the local pubs that night for dinner, The Fox & Hounds, and when we got back, we forgot to put our breakfast choices on the table outside our room, so we figured we'd have to miss out on breakfast the next morning. As we were going out the door, the woman who owns the B&B said, "I'm not going to let you starve!" So she very kindly made us food, which included veggie sausage and bacon options since both her daughters are vegetarians (yay!). The sausage was better than any I've had in the States, so I asked her what the brand was; she said it was Linda McCartney's. Anyone know if that's carried anywhere in the U.S.? 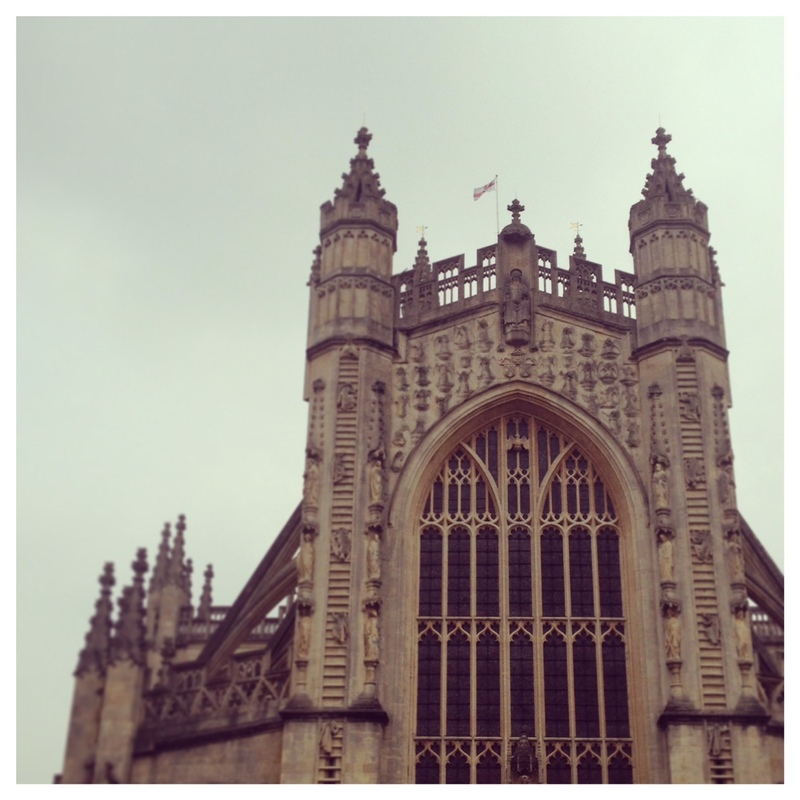 That day in Bath we toured Bath Abbey, which included going up in the towers to see the bells and look out over the town (a gorgeous site!). Then we toured the Roman Baths, which were really interesting; I especially loved the pieces they were able to recover that were part of the temple of Minerva, as well as the head of a statue of the goddess, which was decorated in gold. Claire and I visited some some charity shops and vintage stores after that, but didn't find anything we couldn't live without. Then we took a drive through the country to work up an appetite for dinner, which we ate at Martini, an Italian restaurant in town. Then it was back to the B&B for a rousing game of Phase 10, and then I just couldn't stay awake anymore, so I called it a night. Tasty treats at the pub. The next day we ate another delish breakfast and dropped Claire back in Portsmouth. Then we went on to London, returned the car, rode the Underground back to the hotel, and hung out at The Prince Edward pub down the street until we were ready for bed. Today we're going to see the Tower of London and probably something else, but we'll have to wait and see what that will be! :) Hope you all have a great weekend!